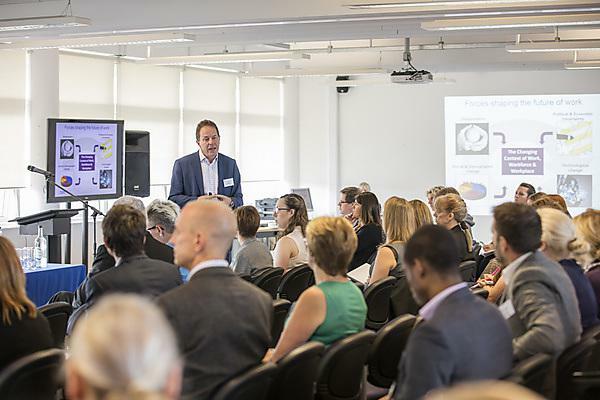 More than 100 delegates from across the South West attended a conference at the University of Plymouth exploring some of the HR challenges facing business leaders now and in the future. The Future of HR Conference was organised by the HR and Leadership group at Plymouth Business School and the iSPER People Organisations and Work research group in conjunction with Devon and Cornwall branch of the CIPD. It brought together business owners and managers, alongside current undergraduate and postgraduate students, and focused on the strategic role of the HR function in creating a fair workplace, improving working lives and harnessing the discretionary effort of employees. The day-long conference included keynotes from Peter Cheese, CEO of the CIPD, and Professor Tony Dundon of Manchester Business School. Professor Richard Saundry and Dr Sue Kinsey, from the People Organisations and Work group within the University’s Institute of Social, Policy and Enterprise Research, presented early findings from a recent ACAS-sponsored research project on the role of HR in the management of conflict at work. Other guest speakers included Tony Cooper, director of ACAS South West, Michael Rabone, ‎Head of Human Resources at The Rick Stein Group, and Eve Skuse, Head of Human Resources at Burts Potato Chips Limited. critical practice and people management. Generate high quality, critical and applied research in the fields of HRM, leadership, employment relations, employment law, organisational theory and work psychology. Disseminate its work to a wide audience through the publication of research findings, workshops and seminars and through this seek to influence policy and practice. Co-ordinate the development and submission of bids for external funding. Build and develop links with practitioners and policy makers. Provide a supportive and inclusive environment for the development of research careers. Monzani, L., Ripoll, P., and Peiró J. M. (2014) "The moderator role of followers’ personality traits in the relation between leadership styles, two types of task performance and work result satisfaction", European Journal of Work and Organizational Psychology, Vol. 24, pp.444-461.